Who doesn’t love a good cupcake, right? I spent part of my Memorial Day baking up some goodies for my first graders who have summer birthdays. It’s one of the ways I choose to fill up my last two minimum days of school before summer vacation! Woo hoo! These cupcakes are cookies and cream. They are made with a standard white cake mix (Duncan Hines) and my scrumptious buttercream frosting. 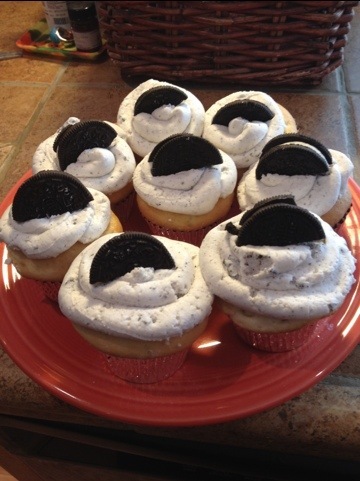 I threw in Oreo cookie crumbs to give the frosting a little flavor , as well as the look of cookies and cream. I used a plastic frosting bag with a hole cut in the bottom (you can do the same thing with a ziplock bag) to frost them in a swirly pattern. This method is much easier and quicker than frosting with a knife, in my opinion. I topped them off with half an Oreo cookie. Yum! Happy birthday to my summer birthday kiddos! This entry was posted in daily muse, dessert and tagged Cupcakes, desserts. Bookmark the permalink.